Each sparkle is made up of one large central square, sixteen half-square triangles (HST) and four small background squares. This pattern is perfect for showcasing your favorite prints since you end up with a large uncut square in the middle of each sparkle! Sparkle Quilt Along: Week One, a photo by jenib320 on Flickr. Tone-on-Tone prints as well as Color + white prints (for more information about these types of prints, see this post from the Art of Choosing) will read as a single color and would be great for your sparkles. Solids or semi-solids like crossweaves/shot cottons/quilter's linen would be fun too! From top to bottom: Ruby by Bonnie and Camille, Dolce by Tanya Whelan, Aviary by Joel Dewberry, Habitat by Michele d'Amore, Oval Elements by Pat Bravo, Parisville by Tula Pink, Modern Meadow by Joel Dewberry, Too Muchery by Helen Dardik, Arvika by Alexander Henry, Outfoxed by Lizzy House, Echo by Lotta Jansdotter, Half-Moon Modern by Momo, Outfoxed by Lizzy House, Secret Garden by Sandi Henderson, 1001 Peeps by Lizzy House, Echo by Lotta Jansdotter, Metro Living by Robert Kaufman, Half-Moon by Momo. Story prints, prints that have some kind of story/animal/person/object, as well as other bold multicolored focus fabrics would make fun sparkles too! From top to bottom: The Woodlands by Khristian A Howell, Metro Cafe by Robert Kaufman, Critter Community by Suzy Ultman, Outfoxed by Lizzy House, Outfoxed by Lizzy House, 1001 Peeps by Lizzy House. When choosing your background fabric, keep in mind the colors you'll be using for your sparkles. To get a nice pop, you'll want to make sure there is plenty of contrast between your background fabric and sparkle fabrics! Solids, semi-solids, and linens would all make great backgrounds! From top to bottom: Farm Fresh by Riley Blake, Quilter's Linen by Robert Kaufman, Smirk gray Grid by Kyla May, Heath by Alexander Henry, Annie's Farm Stand by Lakehouse Dry Goods, Kona white, linen, Sparkly linen from JoAnns. From top to bottom: A Day in the Life by Mummysam, The Woodlands by Khristian A Howell, Castle Peeps by Lizzy House, Tailor Made by Cosmo Cricket, and Follow your Imagination by Prince Charming. One of the great things about these sparkles is that they are fat quarter (FQ) and fat eighth (F8) friendly! You can comfortably get two sparkles out of one FQ! You may choose to have all different sparkles or use a fabric more than once, it's up to you! Each sparkle block is 12.5" unfinished, 12" finished. Check in next week with Megan for cutting instructions! I hope you'll share your fabric choices in the flickr group! Don't hesitate if you have any questions! I'm so excited. I'm using a bundle of Henna Garden from Sandi Henderson in rainbow hues. Can't wait! yay! I've been waiting for this QAL! I'm thinking of using some of my Terrain fq - ya think?? is it possible to have fabric envy? you must have a little fabric store in your house! how fun! so what size quilt are you making? the mini quilt? I'm usually not a joiner (cause I have too many other projects going LOL!) but I totally love this! I'm debating whether to make a mini to hang somewhere in my house or just go for the full size? yes, I have some thinking to do today. This is going to be so fun! Thank you for the suggestions. I will post a picture of my fabric picks in the flickr group soon. I have lots of projects going on, but this is so fun, and I'll at least get a mini on my list, if not a baby quilt! Thanks to you and Megan for putting this together! I just posted my fabric choices to your flickr group! Exciting! 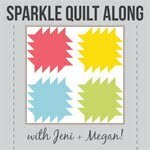 I am excited about joining this quilt along. I've got to try this. Thanks for the different yardages. I will start out "mini" and then work my way up. Here goes another project!!! I am excited about this quilt but I keep seeing the sparkles like a bouquet of flowers. I'll post my fabrics on the flickr pool later. Oh, and thanks for having a comments section with a name/url. I can't tell you how many bloggers I follow that lack this function.